Sunday Salon is the perfect place to introduce a debut novelist. Hilary Davidson is a travel journalist, and the author of eighteen nonfiction books, but The Damage Done is her first crime novel. She marks that debut with an emotional story of a lost woman searching for her missing sister. Travel journalist Lily Moore had escaped to Barcelona because she could no longer cope with her sister, Claudia. Claudia was an emotional heroin junkie, who knew how to push every one of Lily's buttons, beginning with guilt. When she's called home to New York City, it's because Claudia's body has been found in the bathtub of Lily's apartment. But when Lily goes to identify the body, she knows it's not Claudia. So, where is her sister? Who was the woman in the bathtub? Who were the women who had showed up at the apartment, identifying Claudia, while seeming to know so much about Lily's family history? Now, the police aren't looking for Claudia's murderer. They're searching for a missing person, and Claudia must know something about the dead woman. Hilary Davidson's story reveals the complications of family relationships. Love, hate, guilt, resentment can all be combined in the feelings about family. And, Lily and Claudia share a history of family tragedy that united them, while it also drove them apart. How does Lily describe Claudia? "My sister, the magpie who had a thing for shiny jewelry, bad boyfriends, and hard drugs." And, Lily feels compelled to search for her sister, and answers, while at the same time, she feels used. "I was sure that my sister had deliberately lured me back into her web. I was trapped as surely as if her hands were still closing around my throat." Lily is the daughter of an alcoholic, the sister of a junkie. Her best friend, Jesse, safe because he is a gay man, knows her better than anyone. "You want to protect your little sister. You've been doing that your whole life....You never tell anyone the full story. You'd rather keep it locked up." Lily doesn't trust her own heart, and very few people. That makes it difficult for her to accept help, even from the police. And, her anger, and fear, are buried deep. Hilary Davidson's debut, The Damage Done, is a powerful crime novel, the story of a missing woman. But, it's so much more. It's the story of all the damage done in family relationships, including the damage done by addiction. Davidson's given us a profound story that shows the depth, the pain, and the collateral damage caused by addiction, problems that extend far beyond the person with the addiction. 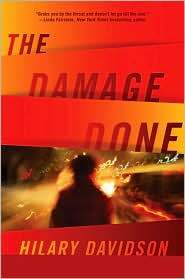 The Damage Done introduces readers to a powerful new voice in crime fiction. Welcome, Hilary Davidson. The Damage Done by Hilary Davidson. Forge, ©2010. ISBN 9780765326973 (hardcover), 352p. FTC Full Disclosure - Both the publisher and the author sent me copies of the book, hoping I would read and review it. FYI: I know this is slightly off-topic, but "Huck" is reviewed in this week's NYT Book Review section, very favorably, I might add. Hilary Davidson is the new Patricia Highsmith. She's going to be BIG! Very much looking forward to reading this one. It's on my Kindle and I'm hoping to get to it in the next few weeks. It sounds great! Sounds like a big I want to read. Thanks for bringing it to my attention. That's great about Huck, Kathy. Of course, the cynical me wants to say, well, the author does work for the NYTimes. What an interesting comparison. I agree. She is going to be big. I can't wait to hear what you think about The Damage Done. I predict you're going to be impressed, too. Thanks, Gautami. I'll be checking it out. It will be interesting to see what you think, Pat. Thanks. Well, I'm afraid Davidson's book is set in NYC, not Barcelona, Book Bird Dog. But, it is a powerful plot. I'm going to check out your Sunday Salon. Thanks! Lesa, I know you have countless books clamoring for attention, so I really appreciate your taking the time to read and review THE DAMAGE DONE. And I especially appreciate your wonderful review! Thank you so much. It's a well-deserved review, Hilary. Once you've known me a while, you'll know I don't review books if I don't finish them, and, in most cases, I only finish the ones I'm enjoying. And, I don't give good reviews just because the author is a friend, or is appearing at Velma Teague. I'm very honest with the review. Your book deserves all of the praise it's receiving. That is so wonderful of you to say, Lesa! Thank you. I can't wait to meet you in November. Many thanks to Paul, Kay, Pat, Gautami, and Book Bird Dog for their kind comments. Also, Book Bird Dog may be happy to hear that my next novel is set in Peru! Are you giving hints about your next novel when you're on book tour, Hilary? Always like a hint or two about the next one.